The Palestra Azzurra nestled in a tropical garden in the lush location of the Solaro Sporting Wellness Resort, coloured by the sun and by the energy of the area featuring tecnogym equipment, opens every day from 9:00am to 11:00pm. An energetic Sunday morning wakeup. Sports and activities such as aerobics, step, toning, total body, G.A.G (Legs, Abs, Bums) 3x20, power pump, spinning, Pilates, stretching and Latin American. 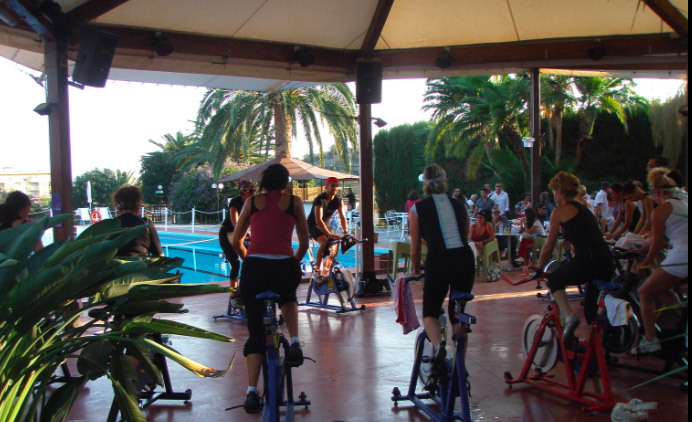 ... and, during the summer days, aquagym classes, spinning, Pilates and swimming classes by the border of the swimming pool. A set of mat exercises to increase power and flexibility, resistance and concentration, guaranteeing a slimmer body, toned abs, strengthen your back and improve your posture. The new revolutionary indoor cycling and music program through a virtual journey with your bike. It is ideal for all thanks to the simplicity of the athletic movement and the efficiency of results. Appropriate clothing is recommended.